CHICAGO – Why do they keep making these awful movies? I’m a horror fan. I think Tobe Hooper’s original “Texas Chainsaw Massacre” is a truly effective (if a bit overrated) movie that has to be included on a list of the most influential of its era. But nearly everything that it has literally spawned has been awful. Sure, “TCM 2” has some wackadoo charm but the modern remakes — the two Platinum Dunes flicks and now this 3D stinker, reecently released on Blu-ray and DVD, are just a waste of time. To be fair, this reboot/sequel isn’t nearly as annoying as the last two but it’s still awful. 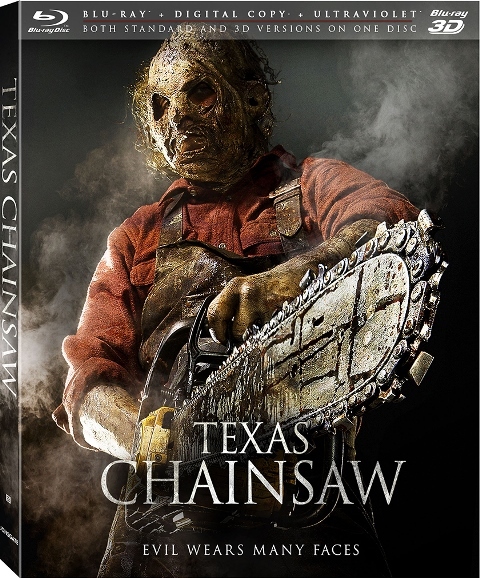 The best idea the makers of “Texas Chainsaw” had was to pick up more directly from the Hooper original instead of just going the traditional remake route. In fact, the credits consist of scenes from the original with the opening scene picking up right after as townspeople burn down the site of the original massacre. The “huh” response from viewers should be immediate. Why are they grafting a local mob angle on to the Leatherface myth? Should we feel bad for the cannibals when their house is burned to the ground? Huh? It turns out that a baby survived the torching. Years later, that baby has grown up into a gorgeous woman (Alexandra Daddario) who, of course, not only discovers her lineage but the fact that Leatherface is still living in the basement of her old family home. She brings some friends, they get sliced up, and it feels like “TCM” is going relatively predictable places. Then it gets WEIRD as the creators once again choose to go the strange route, suggesting that the townspeople are as dangerous as Leatherface’s family. It goes from predictable to nonsense. At least they tried something different. Tried and FAILED. I just wish they would stop trying. I’m starting to feel bad for Leatherface. Despite my general loathing of the film, fans of it will be happy with the copious special features, including a commentary track that features the legendary Hooper himself. “Texas Chainsaw” stars Alexandra Daddario, Dan Yeager, Trey Songz, Scott Eastwood, and Tania Raymonde. It was released on Blu-ray and DVD on May 14, 2013.